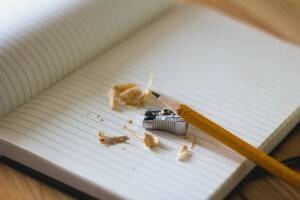 If your first instinct when you have to study, is to open up your notebook, then you know just how important it is to take good, effective notes that will help you refresh your knowledge and prepare for your tests. For that reason, the following post will share some tips you can try if you want to improve your note-taking skills. Keeping clean and organized notes (free of doodles, and in a designated notebook/folder for the subject) will help you focus better on learning when you're studying. Unless you want to fall behind when writing notes, it's a good idea to keep your writing tools handy. Having your pencil, sharpener, eraser, and more, ready will help you save time. As stated, you need to be time-efficient when taking notes, lest you miss noting the information the teacher is sharing. For that reason, employ common abbreviations and writing main ideas to be quicker. Yes, you should be quick. But this doesn't mean your penmanship and the sense of your notes should suffer. Write legibly and form complete ideas/phrases/sentences so your notes can help you. Dates, formulas, names, definitions, and similar information can be more important than other notes you take. Use highlighters and colored pens to make sure they don't get lost in your notebook. Finally, make it a point to review your notes once you're done with them. This will help you spot any missing information or if something isn't clear. If that's the case, ask your teacher or a peer to clarify. If you require extra assistance when you're studying, keep in mind that at The Tutoring Center, League City TX you'll find the academic support you need to become a better learner. Contact them at (281) 337-2800 to request more information on their academic programs, or to enroll in one-on-one tutoring in League City TX.